Is your OST file growing large in size? Is your MS Outlook application becoming slow? Looking for the solution to reduce Outlook OST file size? Did not find any solution? No need to worry because all your searches end here. In this blog, we have discussed all possible solution to compact Outlook OST file. OST file or Offline Storage Table is basically a replica of Exchange Server mailbox, stored on the client machine whenever a cached Exchange mode is enabled. This OST file generated automatically through Outlook Offline folder feature. However, it becomes active when Exchange Server is in offline mode. As the connection is established again the OST file get synchronized with Exchange Server automatically and update all the changes done in the offline mode. OST file stores everything that a user created or received from the starting of account. The total storage space of the Outlook OST file depends upon the version of MS Outlook a user is using. In 2002 and earlier versions the total storage of OST file in 2 GB. On the other hand, in Outlook 2007 the storage is a limit is changed to 20 GB. However, when it comes to Outlook 2010 and above versions the storage capacity becomes 50 GB. Additional Trick: – Outlook OST file growing in size and showing the unwanted result. Fix this issue by just Converting OST to PST format and delete unwanted files from the server. Therefore, if somehow a user noticed that OST file is growing so large, then it becomes important to manage the size of the mailbox. It is because oversized OST file can create lots of issue like an inaccessible mailbox, corrupt OST file, etc. However, the main purpose of OST file is to minimize the network traffic, reduce the Exchange Server payload and permit users to work in offline mode. That is why, if OST file becomes inaccessible, it will badly affect the normal functioning of Outlook application. Hence, in this blog, different methods to reduce Outlook OST file size is covered. What is the Large OST File Issue? Unable to load or open Outlook OST file. A user is not able to add new data in OST file of Outlook. It becomes difficult to synchronize .ost file with MS Exchange Server. Different type of error messages while synchronization process. However, if the OST file exceeds its size limit, there may be some performance issue. For example, corruption in Outlook OST file. In addition, if a user deletes some old emails or data from Outlook mailbox, it is not reducing the size of Outlook OST file. It simply transferring data to some other folder i.e. deleted item folder due to which the size of OST file remains the same. As every version of the MS Outlook has a different size limit, so a method to shrink OST file size also varies from version to version. Therefore, depending upon the edition of MS Outlook, we have discussed different solutions in this section of the post. 1. First of all, empty the Deleted Items folder. If any of the above methods do not work perfectly, then try OST File Splitter tool one such utility to developed specially to resolve all issues. 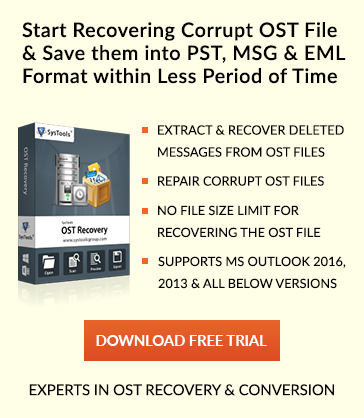 It is a one-step solution to reduce Outlook OST file size in just a few number of clicks. In addition, the software supports MS Outlook 2016/ 2013/ 2010 and all below versions. Considering the need of users, we have discussed all possible solution to reduce OST file size in Outlook 2016/ 2013/ 2010 and below versions. A manual solution has various limitations, so it recommended using a professional solution. It divides the large size OST file into small parts and improves MS Outlook performance.